Bone expander drills are an alternative to osteotomes for the expansion and condensing of the atrophic mandible and maxilla in preparation for dental implant insertions. Expanders are also an alternative to the maxillary sinus elevation technique. 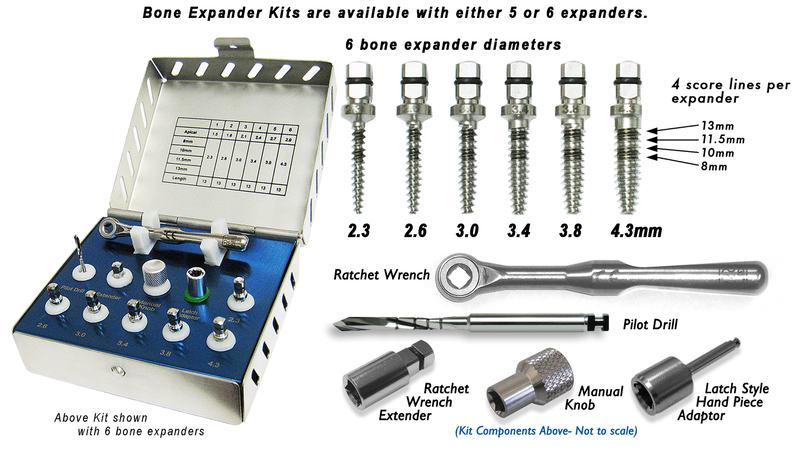 Expanders are driven into the bone with a ratchet wrench or low speed hand piece. This decreases the surgical trauma of osteotomes. Bone expanders improve the clinical success by improving stability, maintaining bone density and increasing fixation. Do not autoclave for extended periods of time (i.e. overnight). Extended autoclaving should not be confused with repeated autoclaving. Repeated autoclaving will not harm the product.